The next stop for the Dinnergeddon gals was supposed to be Bulgaria, which were eagerly looking forward to (there was a rumour that there was 2 Bulgarian places next door to each other and we were going to pip them against each other). But after meeting at Turnpike Lane, we headed to the restaurants and disappointedly found that one was boarded up, and the 2nd was just a bar for local Bulgarians (serving no food). 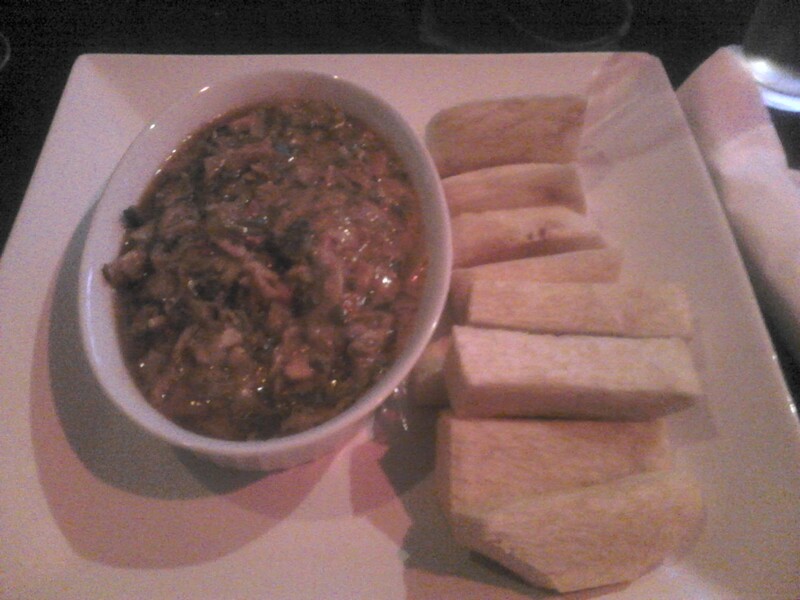 So, with us both getting hungrier, we decided to hunt down a Congolese place which we had heard about in the area. Luckily Okapi was alive and kicking (but quietly, there was only two other people in there) so could finally get some food. The main part of the restaurant looked very fancy, with statement regal wallpaper covering the walls, we however, decided to sit in the corridor next to the toilets because there was comfy cushioned seats and a massive flatscreen TV on the wall opposite. The TV was playing high quality African R’n’B videos, at a ridiculously loud volume that the friendly man serving us had to turn it down to hear our order. This back part of the restaurant was also very dark, hence the lack of pictures of the cuisine, so you’ll just have to use your imagination. The service was very helpful describing what dishes were to us, though I really wanted the slow cooked chicken with spicy roasted pumpkin seeds but they had sadly run out for the day. It was suggested that I try the pork version, as it’s equally as good so though I’m not too keen on pork (see Poland) I decided to give it a go. A bit tough for the vegetarians, Congo. There was no particular ‘marked’ vegetarian dishes on the menu. There was a ‘vegetables’ section, though all but one of these dishes seemed to end their descriptions “…with smoked fish flakes”. However, the Greens in Peanut Butter sauce didn’t, so Jodi’s choice was made. We also chose to share some fried plaintain and yams, because you can’t get enough fried carbs. 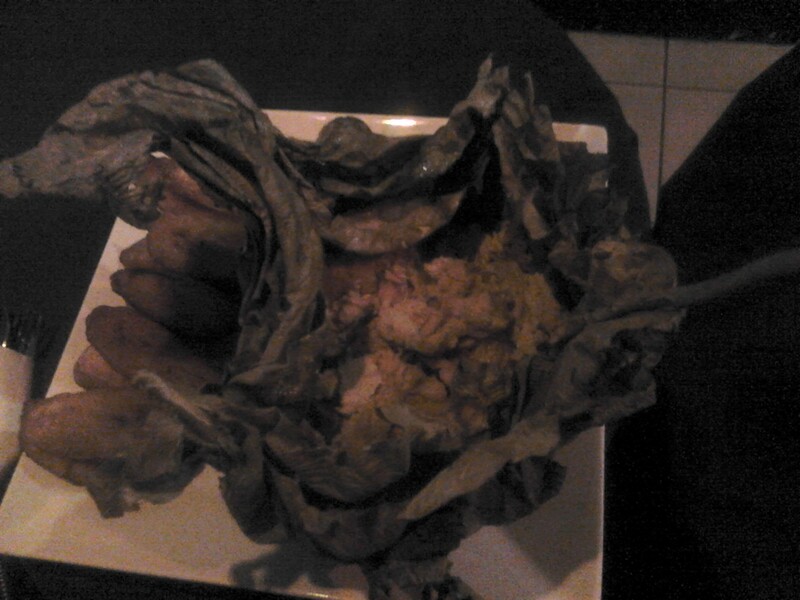 It was dead impressive being brought out my Mbika (slow cooked pork and pumpkin seeds) as it came served in a massive dried leaf, which I think it was cooked in. The pork was good, but after the initial novelty of the big leaf, I got a bit bored and would have liked a bit of chicken. Jodi tucked into her greens with peanut butter sauce and seemed to be enjoying it until she thought there might be something meaty in it. After a bit more hesitant tasting, it was time to ask the waiter if there was meat in it and explain the whole vegetarian thing. Turns out there was smoked fish flakes in the greens, and a new bowl (without fish flakes) was swiftly brought out. I don’t really know why Congo is obsessed with fish flakes so much, or maybe someone at Okapi just really likes fish (or hates vegetarians). We will never know. Despite all the confusion of the evening, I think we would give a thumbs up to Okapi, there staff were very smiley and friendly, the food was interesting and something we probably wouldn’t have tried otherwise, plus the ridiculous music videos provided a nice bit of light entertainment. Service 9/10, food 8/10, environment 7/10. This entry was posted in Uncategorized and tagged Africa, Congo, Congolese, Dining, dinner, Dinnergeddon, eating, Food, London, mbika, Okapi, Tottenham by dinnergeddon. Bookmark the permalink.